Today I bought some delicious healthy pasta - whole wheat tagliatelle with basil. I was very curious to see how they taste but in the same time I really wanted to make a roasted red bell pepper salad, because I was craving for it for a very long time. I decided to combine them and make a main dish salad. It was a great decision! All flavors blend together perfectly!You'll definitely like this light, colorful and savory salad. Enjoy! 1. Roast the red bell peppers. 3. Cut red bell peppers into long, thin strips. 4. 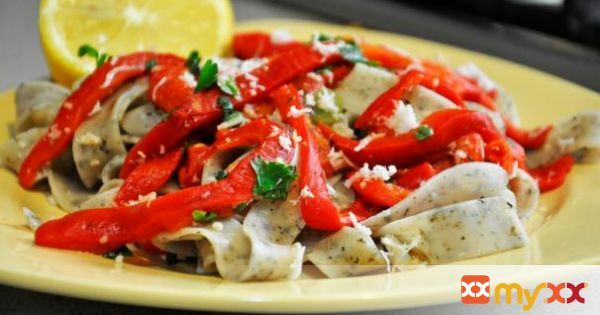 In a large bowl mix the pepper strips with all other ingredients except pasta. 5. Add water in a large pot and let it boil. 6. When it has reached boiling point add the pasta. 7. Check the info on your pasta package to see how many minutes it has to boil. 8. Mix everything together. Serve!